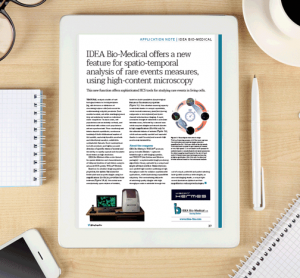 IDEA Bio-Medical specialises in HCS imaging systems as well as image analysis software which allows tailor- made biological applications based the company’s unique algorithms library. The company is developing novel image-based screening platforms for the pharmaceutical industry and medical centres – dedicated to broadening the scope of personalised medicine. The systems IDEA Bio develops incorporate the most advanced technologies currently available in the machine vision field, integrated with engineering methodologies of high reliability and quality at the level of semi-conductors and digital printing industries (speciality of the mother company). IDEA Bio’s products are unbeatable in terms of performance, reliability and price. The IDEA team has a highly service-oriented understanding of customers’ needs and the risks inherent in their operations. The service department of IDEA Bio utilises all IDEA group’s departments for customer support, , including technical services , software support, application development, etc.